I need to confess we have been working at unprecedented pace this week. Almost every day I got news on updates appeared and the next product release. And what is more surprising – we really went mobile and delivered 3 extensions, related to mobile design and functionality. If you care about customers who generally prefer mobile devices to PCs nowadays, we suggest you to consider the following solutions. 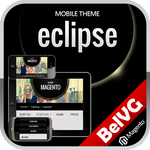 Magento Eclipse Mobile Theme complies with Magento 1.7 mobile standards. It’s black & white design is accurate and user-friendly; cute slider in the upper side of the site will highlight the most important features for your customers. The Eclipse Mobile Theme supports all mobile OS like iPhone, iPad, Android, Windows Mobile, Blackberry and others. Magento Smart Theme is designed both for PC and mobile gadgets. Its metallic shaded background is perfectly suitable for selling technical devices. The theme also complies with Magento 1.7. and is designed for all desktop and mobile devices. Magento Tablet Dashboard allows you to control your store statistics via tablet. The extension grants you the control over sales and cache when you are out of home or office. Four most essential administrative tabs – Dashboard, Orders, Cache Management and Log out – will always be at your service. Magento Flexible Prices provides functionality to establish flexible price policy for individuals and groups of customers. Compose groups of users and choose individuals to show them different price labels for the same products. Assign the time limit for your price rules or set them with no fixed term.